At eighty-five, Zbigniew Brzezinski still emits a rare kind of wisdom — one of intellectual energy and strategic foresight that has for decades advised former US presidents, shaped American foreign policy, influenced geopolitics and inspired policymakers and students alike. He did this once again with charm and thought-provoking remarks to a packed Kenney Auditorium on Tuesday, October 22. Hosted by SAIS DC, the highly anticipated forum — entitled “What Does National Security Mean Today?” — drew an audience of students, staff, faculty, media and a “Who’s Who” of former US government officials — including panelists former US Secretary of State Madeleine Albright, former US Secretary of Defense Robert Gates and former US National Security Advisers Stephen Hadley and Brent Scowcroft, among others. 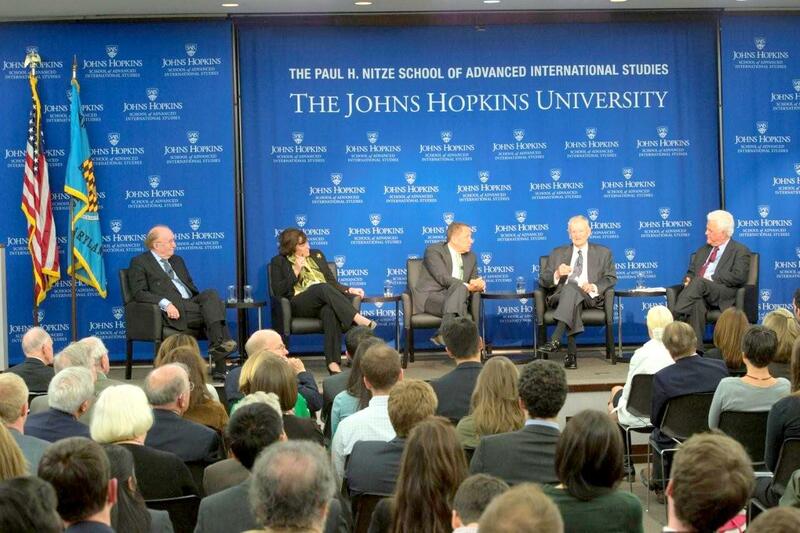 Moderated by American journalist David Ignatius, the two-and-a-half hour forum celebrated the release of the new book “Zbig: The Strategy and Statecraft of Zbigniew Brzezinski,” edited by SAIS scholar Charles Gati and published by Johns Hopkins University Press. While tailored to presidential ears, this advice is equally apt for students. In the plethora of classes, clubs, happy hours and brown bag lunches, the SAIS experience is only two years for most and just one for others. Learning the ropes of SAIS early is key but so too is prioritizing your time for the next chapter — the working world. These capabilities are vital for contending with the geopolitical challenges of the day, including for example the Syrian Civil War, Iran’s nuclear aspirations, the future of Afghanistan and Iraq, international terrorism and China’s emergence as a global power. In the Cold War, such geopolitical moves were simpler than they are now — largely symmetrical, and linear — like those in a game of checkers. The United States and Russia were clear foes. But times have changed. The world is still round — and the board still square — but in today’s global game of chess, the pieces are varied and the moves more intricate and thereby necessitate strategic thinking years and decades in advance. “What we have to do as a country, however, is be alert to the fact that the world has become infinitely more complex,” Brzezinski shared. The club of power belongs no longer to just the nation-state — though unquestionably still dominant — as the rise of non-state actors, corporations, and international organizations are also gaining entry into the new world order. The “global political awakening,” as Brzezinski coined several years ago to describe increasing political consciousness and worldwide populist activism, is a new force in international relations. So, too, are the “information revolution” and the “disaggregation of political voices” as Secretary Albright mentioned. Big ideas they are, and big tasks they engender; but with the right preparation, these novel forces are not beyond America’s capacity to confront, to manage, and even to influence in the next chapter of world history. Brzezinski served as National Security Adviser to President Jimmy Carter from 1977 to 1981. Next Observer Cartoon – Happy Halloween!